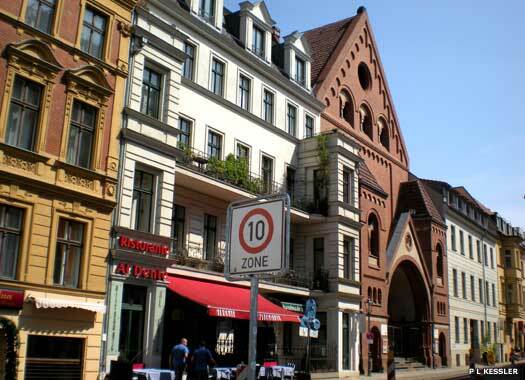 St Mary's Church (St-Marien-Kirche in German) lies on the open southern side of Karl-Liebknecht-Strasse, immediately west of Alexanderplatz. 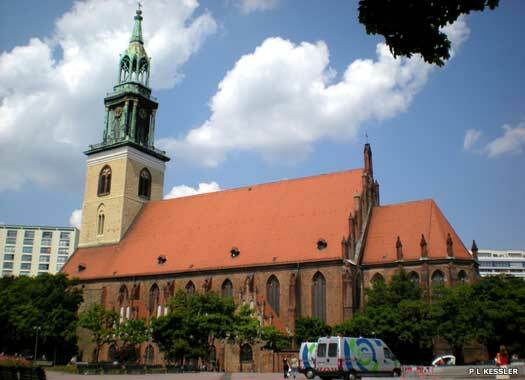 The church was designed as part of medieval Berlin's expansion after 1250. The Gothic church underwent a major transformation in the Baroque period in the 1700s, especially with the installation of its new pulpit. In 1893-1894 more work was undertaken, restoring some Gothic elements, which remained undamaged by the war. The Chapel of the Holy Spirit Hospital (Heilig-Geist-Kapelle) is on the western side of Spandauer strasse, on the south-western corner with Anna-Louisa-Karsch-Strasse. The stone chapel was built from about 1250 and completed at the beginning of the fourteenth century, serving the poor within the walls of the hospital. Reconstruction work took place about 1520, when a star-ribbed vault was installed. Today the chapel is part of the Humboldt University of Berlin. St Sophia's Church (Sophienkirche) is squeezed between Sophienstrasse and Grosse Hamburger Strasse, overlooking Krausnickstrasse. 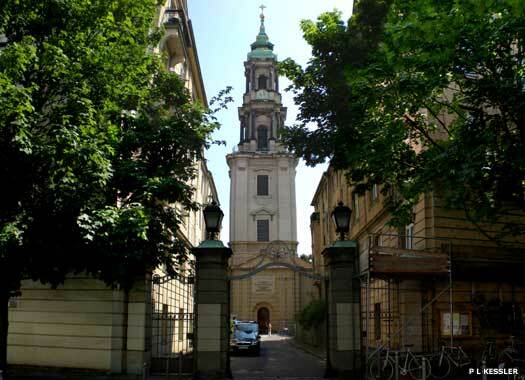 It was built as a parish church in 1712-1713, founded with support from Queen Sophie Louise (1685-1735), the third wife of Frederick I of Prussia, for a congregation which wanted its own church instead of having to use the thirteenth century St George's Church (in Alexander Platz, destroyed during the war and demolished in 1950). 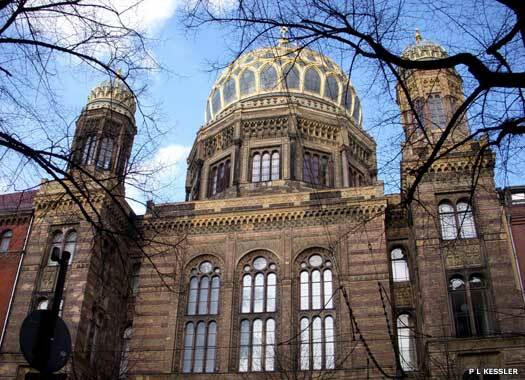 The New Synagogue (Neue Synagoge) is on the northern side of Oranienburgerstrasse, midway between Krausnickstrasse and Tucholskystrasse. It was built in 1859-1866, the largest building of its kind in Berlin. Its splendid eastern Moorish style and resemblance to the Alhambra made it an architectural wonder. It was demolished during the Second World War and completely reconstructed in 1988-1995. Today it is permanently patrolled by guards. 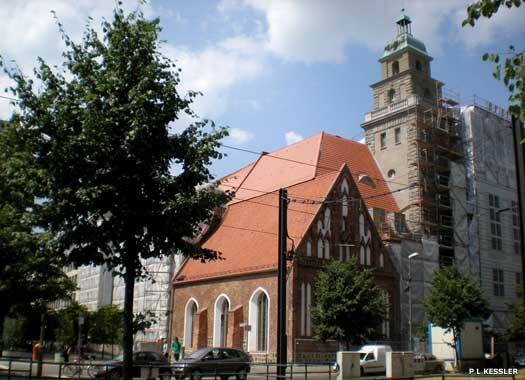 St John the Evangelist Church (St Johannes Evangelist Kirche) is on the northern side of Auguststrasse, close to the junction with Oranienburger Strasse, to the north of Mitte. The church was designed by Max Spitta and built in 1898-1900 in the neo-Romanesque style, following the 1856 creation of a parish here from part of that of St Sophia (see above), and the building of a temporary chapel. After the war, its depleted congregation was parcelled out to the other local churches. 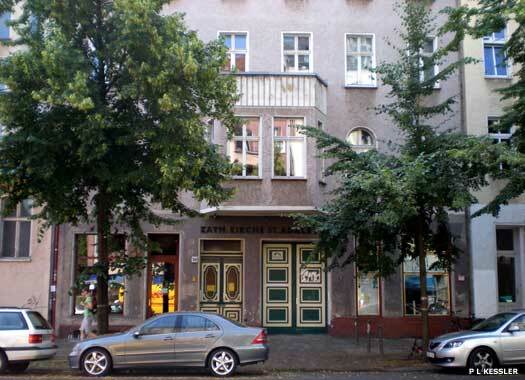 Golgotha Church (Golgathakirche) is on the eastern side of Borsigstrasse, midway along the southern section of the street. Otherwise known as Calvary Church, it was built near the old city wall in 1867, which was torn down at the same time during a period of rapid industrial expansion. Designed by Karl Friedrich Schinkel, it was a western sister to St Elizabeth's Church in the east of the district (below). In 1877 it gained its own parish and was entirely rebuilt in 1897. The Catholic Church of St Adalbert (St-Adalbert-Katholisches-Kirche) sits between Linienstrasse (the main entrance) and the southern side of Torstrasse, opposite Bergstrasse (the rear entrance). The Grade II listed building was designed by the architect Clemens Holzmeister and the church was opened in 1934, following the creation of its parish in 1927. Initially services were held in a nearby school. The church is a daughter of the Sacred Heart Church (below). 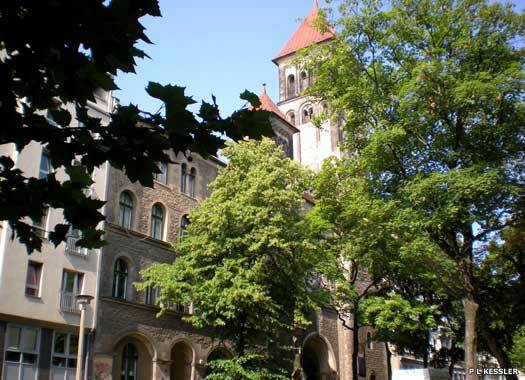 St Elisabeth's Church (St-Elisabeth-Kirche) occupies a green and leafy site on the inside of the curving Elisabethkirchstrasse. The church was built in 1835 by Karl Friedrich Schinkel, on a commission by King Friedrich Wilhelm III (1797-1840). 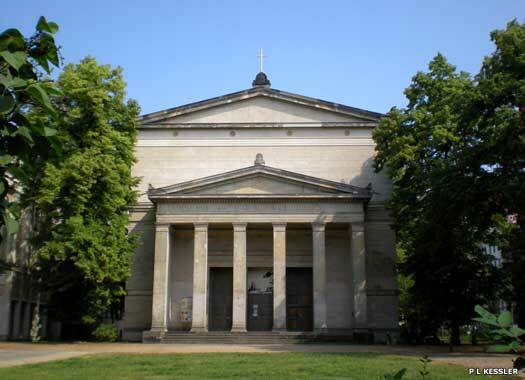 Designed in the 'antique style', it was one of five churches by Schinkel. It was renovated in 1935 for the centenary, but in 1945 it was hit by an incendiary bomb and completely burned out. Reconstruction work took place between 1991-1999. 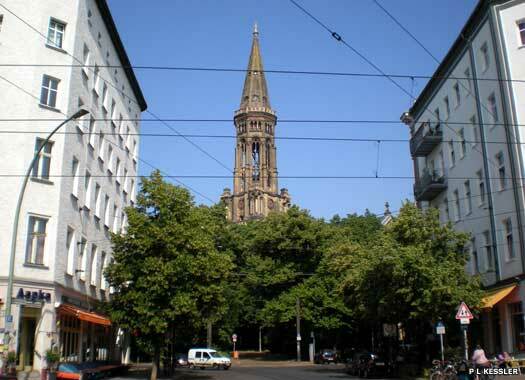 The Zion Church (Zionskirche) is hemmed in by close trees at the centre of a square which is bisected by Zionkirchstrasse and Griebenowstrasse. 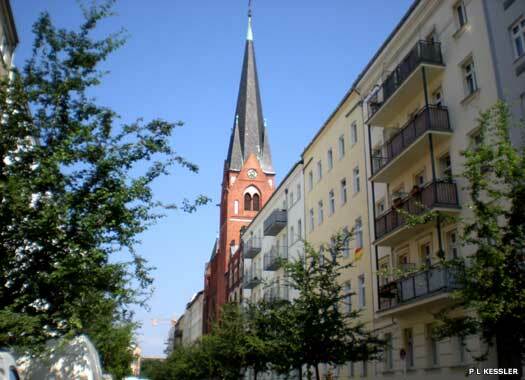 The church was built for this working class neighbourhood with very little money, the work aided by donations from Prussia's military victories. Completed in 1863-1873, the funds for the sixty-seven metre tall tower were donated by William I. 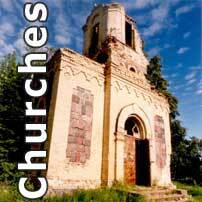 The church was always packed for services but it was locked up for a time under the GDR. Sacred Heart Catholic Church (Katholische Kirchen Gemeinde Herz Jesu) is on the leafy western side of Fehrbelliner Strasse, midway between Schönhauser Allee and Christinenstrasse. The church was built in the Lower Saxon, Roman and early Christian Byzantine style, with construction starting in 1897, and taking sixteen months under Christoph Hehl, a professor of medieval architecture. The great bell tower is forty-eight metres high. The organ was built in 1899.